Opposition leader hints she does not support Avi Gabbay's position that he will head the party's list no matter what. 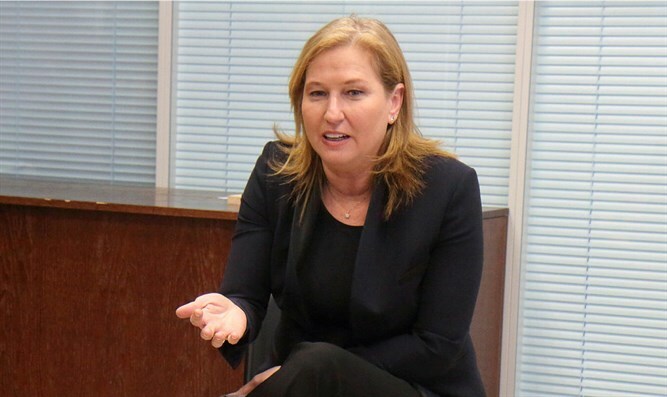 Opposition leader Tzipi Livni on Tuesday discussed the upcoming elections and called for a united front in the center-left bloc. Livni hinted that she does not accept the declaration of Zionist Union chairman Avi Gabbay, who stressed that he will lead the Zionist Union in the coming elections. "The only way to win the elections is to join forces. The connection itself creates a new dynamic and hope. Anyone who shares the path and declares that the good of the state comes first, must also be a partner in the unity between us." "We can create a bigger and more successful team here. Together we will say: First comes the state, then the party, and then myself,” Livni said. "I proposed this in 2013. I did it in 2015. We established the Zionist Union, which is an excellent basis for the connections. I've made concessions in the past and I'm ready to do it again. These connections are needed in order to create the largest list in Israel. This is what our path needs to be in the upcoming elections,” she added. On Monday, after the coalition agreed to hold elections on April 9, Gabbay said that “these are elections between me and Netanyahu”, explaining that the reason for this is that the heads of other parties had stated they would be willing to be part of a government headed by Prime Minister Binyamin Netanyahu. “These elections will be between those who are satisfied with what is in front of them and those who believe and who hope. Starting today, we begin to write a new story for the State of Israel. A story of success, of cooperation, of change," added Gabbay. Despite Gabbay’s statement, the party is failing to gain traction in polls. The Likud, headed by Netanyahu, continues to maintain its commanding lead, while the Zionist Union wins just 11 seats.